Every year, the DC Public Charter School Board (DC PCSB) releases its School Quality Report, which evaluates all public charter schools in grades prekindergarten (PK) to 12 and adults in Washington, DC. What is the School Quality Report? Families use this important annual School Quality Report to evaluate the diverse public charter schools throughout the city. The Report (formerly known as the Performance Management Framework or PMF) evaluates 123 public charter schools educating students in grades pre-kindergarten (PK) through 12 and adults on common factors. These factors include college and workforce preparation, English and math achievement, and year-to-year student academic growth, as well as family satisfaction as measured by re-enrollment rates. Individual school reports are available on DC PCSB's website. The Report also includes a description of each school’s unique mission along with other useful information to help families evaluate every public charter school. What does the score and tier mean? Scores between 65 and 100 are Tier 1. Tier 1 schools meet standards of high performance. Scores between 35 and 64.9 are Tier 2. Tier 2 schools fall short of high performance, but meet minimum overall performance standards. Scores lower than 35 are Tier 3. Tier 3 schools fall significantly short of high performance standards showing inadequate academic performance and student achievement. The School Quality Report for PK-12 schools are divided into four categories: Student Progress, Student Achievement, Parent Satisfaction and Attendance. Each category evaluates the performance of each school. Student Progress measures student growth in English language arts (ELA) and Math on the PARCC assessment for one or two school years. For schools ending in grades K-3, the Northwest Evaluation Association Measures of Academic Progress (NWEA MAP) data is used to report on growth. For schools with students in grades 3-8 or high school, PARCC data is used to report on growth. Student Achievement measures the percentage of students who are approaching and meeting/exceeding expectations in ELA and math on the PARCC. Additionally the Report displays student outcomes that predict future educational success. In elementary school, students need to be reading on grade level by third grade to be able to access the content in upper elementary school. In middle school, students need to be on grade level in math in eighth grade to have the best opportunities for success in high school. 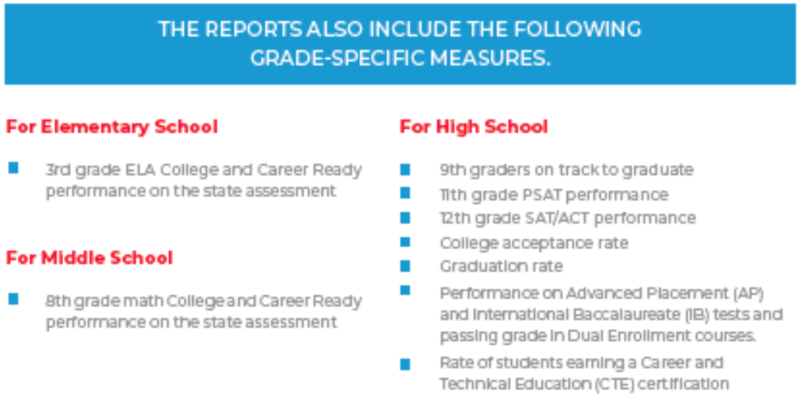 The School Quality Report for high schools includes measures that assess success on the PSAT, SAT, AP assessments, as well as other college and career-ready measures. The School Quality Report also includes factors that are not based on test scores, includes student attendance and student re-enrollment in the same school. For schools with PK programming, School Environment also includes information on teacher student interactions in the classroom through the CLASS observation tool measures of Emotional Support, Classroom Organization, and Instructional Support. Overall, schools’ tier and outcomes on the previously mentioned measures, in addition to visiting a potential school, can help families decide which school is the best fit for their child. Furthermore, the School Quality Report help school leaders and other stakeholders assess the performance of DC public charter schools.